In 1966, traffic crashes resulted in over 50,000 fatalities and the fatality rate was three times as high as it is today. Congress recognized this public health crisis and created the Department of Transportation and the National Highway Safety Bureau. That momentous event was a crossroad in our nation's efforts to address this crisis. If the extraordinary progress in improving highway safety had not been made since that time, over 120,000 people would have died last year and hundreds of thousands more would have suffered traumatic injury. Death and injury from traffic crashes continue to be among the most serious public health problems facing our country. Motor vehicle injuries constitute 99% of non-fatal transportation injuries and 94% of transportation deaths. The statistics for 1996 alone offer a grim reality: there were over 6.8 million crashes, in which over 41,000 were killed and another 3.5 million were injured. With yearly increases in travel and no improvement over our current safety performance, fatalities and injuries could increase by 50 percent by 2020. This is simply unacceptable. Motor vehicle crashes are the number one safety problem in American transportation. They account for 94 percent of transportation death and 99 percent of transportation injury. In 1996, 41,907 people were killed and 3,511,000 people were injured in police reported crashes. The lifetime economic cost of these crashes is over $150 billion annually. The share borne by tax payers is staggering: the public pays 13 percent of the cost of injuries treated in an emergency department; 26 percent of the cost of injuries requiring hospitalization; and 48 percent of the cost of injuries treated in a rehabilitation hospital. The challenges facing us in the future are daunting. Demographic populations such as older and younger drivers who are over involved in crashes will grow significantly. Aggressive driving and speeding are becoming more common with increased travel and congestion. The improvements in the fatality rate have been flat for the past several years as has our progress with drunk driving. With yearly increases in travel and no improvement over our current safety performance, fatalities and injuries could increase by 50 percent by 2020. 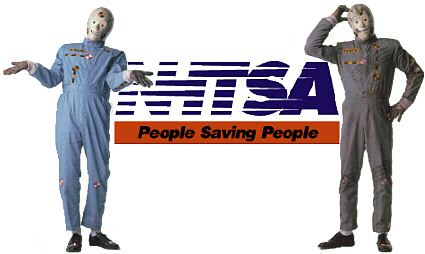 The National Highway Traffic Safety Administration (NHTSA) is dedicated to public health and injury control. The Agency, as part of the Department of Transportation (DOT), enhances the quality of highway transportation by helping to make it safer and more economical. NHTSA is multi disciplinary, drawing from such diverse fields as epidemiology, engineering, biomechanics, the social sciences, human factors, economics, statistics, education, law enforcement, medicine, and communication to address some of the most complex and challenging problems in the field of public health. Working towards greater traffic safety. Ensuring that vehicles are as safe as possible. Striving to keep unsafe drivers off the road. Lead the effort to make traffic and motor vehicle safety a priority on the nation's health care agenda. Lead a national effort to address the most significant traffic and motor vehicle safety issues. Deliver the highest quality technical and program assistance to States and communities, and promote international cooperation. Support research and apply the results to education, engineering, and enforcement to reduce road casualties and costs. Improve the internal processes, management, and structure to create a more effective and efficient Agency. Changes in demographics, travel, health care, motor vehicles, the role of government and behavior are all factors that affect highway safety. Population Growth: Major growth in population is a demographic change that will influence the scope and character of transportation demand and safety needs in the 21st century. From 1995 to 2020, U.S. population is predicted to grow from 267 million to 323 million. More people translates into greater travel miles, and this in turn results in a greater level of exposure to traffic crashes. Barring effective safety interventions, we can expect more crashes, and consequently higher fatality and injury levels. Aging of the U.S. Population: The population of Americans over age 65 will increase from 34 million today to 53 million in 2020. Older Americans are over represented in traffic fatalities (9 percent of the population involved in 13 percent of the fatal crashes and 17 percent of the pedestrian fatalities). Their fatality rate is 17 times as high as the 25-65 group. Special safety risks associated with older drivers, occupants and pedestrians will demand new strategies. Large Number of Younger Drivers: Even though the U.S. will have passed the peak (2010) of the baby boomlet, we will have a larger population of younger drivers in the 16-24 age group than we do today (43 million in 2020 versus 36 million now). The special high-risk behaviors associated with younger drivers cause over representation in traffic crashes. We can anticipate the same safety problems in 2020 unless effective strategies are implemented. Ethnic Mix of the U.S. Population: Due to high levels of immigration in the 1980's and differential birth rates among ethnic groups, the ethnic mix of the U.S. population begins to change by the end of the 20th century and continues to change through the early 21st century. Language barriers and different cultural norms could affect traffic safety. Distribution of the U.S. Population: Between 2000 and 2020, 82 percent of U.S. population growth will be in the South and West. These areas are more reliant on motor vehicle travel than the Northeast. The increased concentration of the population in urban areas is forcing people to move farther away from core cities in order to find affordable housing, making commuting distances longer. Corporations are also moving away from central cities. This shift in population will increase driving distances which increases exposure and will lead to a higher risk of crash. More travel may occur on high speed roads in non-urban areas, further increasing crash exposure. Travel Patterns: Home catalog shopping and efficient package delivery services are significantly changing shopping patterns in the late 20th century. Although this will reduce short-trip traffic, it will significantly increase commercial vehicle travel. More large trucks will share the road with passenger vehicles and this will increase the risk of crashes involving vehicles of incompatible size. Congestion: The nearly 1 billion vehicles world-wide in 2020 will lead to stifling levels of congestion. If driver stress resulting from this congestion leads to aggressive driving, America could see a significant increase in unsafe driving behaviors. Economic Trends: Fatalities have historically correlated fairly strongly with economic cycles. When the economy is strong and growing, people tend to increase their recreational driving. With this increased exposure, highway fatalities increase. During recessions and periods of high unemployment, discretionary travel decreases, exposure decreases and in turn, highway fatalities decrease. Prevention: Increased public understanding of the true impact and cost of unintentional injuries (particularly motor vehicle crashes as the leading cause) will garner greater public attention and resources devoted to prevention. More emphasis will flow to preventing injury rather than responding and treating. Public education will play a critical role, in keeping with the increased emphasis on positive actions and incentives to prevent injury and illness to a greater degree than at present. This is in line with the tremendous shift toward managed health care, which promotes a strong emphasis on prevention of illness and injury. Improvements in EMS Services and Technology: EMS will have evolved by 2020 into community-based health management that is fully integrated into the overall U.S. health care system. As such, it will function cooperatively with health care delivery components as well as public health and public safety agencies. The future will see strengthening all along the continuum of EMS, starting with automatic notification of the need to respond, for example to the scene of a vehicle crash, and ending with data linkage back to vehicle design to ameliorate crash injury causation. Motor Vehicles: Expected changes in passenger vehicles will be as profound as any that have occurred over the history of the automobile. In the early years of the 21st century, significant new power sources will be added to the standard gasoline fueled internal combustion engine. The ways that drivers interact with the vehicle and how vehicles interact with the road and surrounding vehicles will be significantly altered as well. Customers will demand larger, roomier cars and manufacturers will be forced to find new ways to reduce vehicle weight or improve engine efficiency to meet Corporate Average Fuel Economy (CAFE) Standards and higher goals for fuel economy. Greater use of aluminum and plastic for exterior components is anticipated. Demand For Safety: A fundamental change in the public's view of safety has occurred over the last decade. Many customers are not only willing to pay extra for safety features, they are now selecting vehicles based on their content of key safety items. This trend is expected to continue and to intensify in the years ahead. Intelligent Transportation System (ITS) Technologies: Emerging ITS technology could dramatically reduce the number of collisions on the nation's highways. A recent analysis suggests that a reduction of more than 1 million collisions per year is possible by 2020. This would correspond to a $25.6 billion economic savings per year. Alternative-fueled Vehicles: In 2020, nearly 11 percent of all light duty vehicle sales will be alternative-fueled vehicles (AFV's), of which about 3 percent will be dual fuel methanol, ethanol, liquid propane gas, compressed natural gas, or electric vehicles. Safety implications involve the size of the AFV, the materials used in its construction, safety of the alternative fuels, how and where the AFV will be used. Vehicle Size Compatibility: The continued growth in light truck sales relative to passenger car sales will continue to have a negative impact on overall fleet safety. This is due to differences in size, weight, and vehicle handling characteristics. The first and most alarming safety issue is that high profile vehicles are more prone to rollover during certain steering maneuvers. In addition, when high profile vehicles are in crashes with lower profile vehicles, the mismatch in size or weight creates significant hazards for occupants of the smaller vehicle. Aluminum and Plastic Exterior Components: Lighter vehicles built with aluminum and plastic may create additional safety problems due to the basic physics of a heavy object crashing into a lighter object. These lighter vehicles will also have engines with higher power output due to improved efficiency and lower weight thereby maintaining present day performance with increased fuel economy. The Global Market: Over the past few decades, commercial success for most major products has required global marketing and distribution. The automobile industry in particular has become dependent on a global market, with each car manufacturer vying for increased market share worldwide. The typical car is now built with components and subassemblies produced in six or more countries. This global market is forcing automobile manufacturers to institute designs and features acceptable in numerous countries. Global marketing creates an opportunity for NHTSA to exercise leadership in establishing U.S. automobiles as the world's benchmark for vehicle safety. Harmonization: Global marketing is also increasing the demand for nations to establish similar regulatory and certification procedures in order to facilitate trade. As a result, agencies such as NHTSA and the Environmental Protection Agency (EPA), whose missions are related to safety and the environment rather than to trade, are urged to find ways of harmonizing standards with those of foreign governments. If an international effort is successful, increased uniformity could profoundly address deficiencies at home and abroad. This marketing approach is designed to improve efficiency and minimize the economic burden to industry. However, our challenge is to bring the world's best safety technology to the U.S. market. The Role of Governments: In the final years of the 20th century, welfare and education programs are being transferred to the States. Calls for a balanced budget, user fees, and innovative financing arrangements are changing the way in which the Federal government interacts with State governments. Greater Personal Responsibility: As the Federal government's involvement in the lives of citizens dwindles, personal responsibility will became paramount. With the shift away from governmental solutions, individuals will be held more responsible for their own behavior and safety. This can have a significant effect on liability laws and insurance coverage. If medical insurance coverage is negated by certain unsafe behaviors such as smoking, drunk and drugged driving or failure to use proper safety equipment such as seat belts and bicycle helmets, behavior will hopefully change. This could lead to a marked reduction in the use of tobacco, alcohol and illegal drugs. State And Regional Decision Making: If Federal programs continue to diminish in the early years of the 21st century, State, Municipal and Regional Planning Organizations could become the new power centers of America. The various programs could collect user fees and consumption taxes on a regional or State-wide basis. If the Federal government decides to consolidate all Federal grant programs, safety grants could be packaged with welfare, education, housing and energy grants. Under this scenario, the Federal government would have little influence on how the funds are used. The Federal government would conduct research to define effective programs and the State, Municipal or Regional Planning Organizations would determine where and how to use the resources. Privacy Concerns: Privacy issues are again moving to the forefront as many law enforcement officers begin to use electronic monitoring technology to document their transactions with citizens. This includes DWI enforcement and traffic stops. Cities also have begun electronic monitoring in parks and on streets as a way of reducing crime and unsafe driving (such as running red lights and speeding). Although electronic monitoring has enhanced law enforcement, and recorded collisions thereby facilitating improved crash avoidance technology, the privacy implications have yet to be resolved. Behavioral Trends: Facilitating safe driving behavior is a major portion of NHTSA's technical assistance to States and communities. The Agency is continually seeking new ways of communicating the need to not drink and drive, wear safety belts, and properly use other safety equipment. Impaired Driving: Americans better understand the impaired driving problem, fewer are driving after drinking, and more are getting caught when they do. Unfortunately, alcohol-related crashes may be headed back up. Fatalities in alcohol-related crashes rose by 4 percent from 1994 to 1995, the first increase in a decade. Only 7 percent of all crashes involve the use of alcohol, but 41 percent of the 41,907 motor vehicle crash deaths in 1996 had some alcohol involvement. Restraint Use: Vehicle safety continues to improve with the advent of full fleet implementation of driver and passenger air bags. However, without significant increases in the use of safety belts, full potential will not reached. The rate of increase in belt use has been stagnant for the past few years and is the lowest of any industrialized nation. Increased public awareness could help change risk-taking attitudes and behaviors. Use of child safety seats remains a major concern; studies indicate that up to 80 percent are installed or used incorrectly. If groups in a number of States are successful in repealing or weakening motorcycle helmet use laws, then helmet usage will drop dramatically. Speeding: In 1996, speeding was a contributing factor in 30 percent of all fatal crashes accounting for 12,998 lives lost. In 1996, 41,000 people received critical injuries in speed-related crashes, 75,000 received moderately severe injuries, and 624,000 received minor injuries. Speeding, exceeding the posted speed limit or driving too fast for conditions, occurs at all speed limits. As more roads are posted at above 55 miles per hour, more people may drive too fast for conditions, and speed-related fatalities and injuries may increase. Aggressive Driving: Aggressive drivers pose a high risk -- they are more likely to drink and drive, speed, and drive unbelted. They run stop signs and red lights. They tailgate, weave in-and-out of traffic, pass on the right, make improper and unsafe lane changes, make hand and facial gestures, scream, honk and flash their lights. Studies indicate that more Americans worry about aggressive drivers than they do drunk drivers. As stated earlier, driver stress resulting from increased levels of traffic congestion could significantly increase the incidence of aggressive driving. The previous pages have described the trends and resulting traffic safety situation that could occur if immediate action is not taken to mitigate one of the most serious health problems facing our country -- death and injury from traffic crashes. With yearly increases in travel and no improvement over our current safety performance, fatalities and injuries could increase by 50 percent by 2020. Given this bleak prospect, the Agency must (1) become a catalyst for improving the human element; (2) facilitate the design and deployment of the most effective vehicle and road technology; (3) drive the costs associated with traffic crashes to an absolute minimum; and (4) exploit information technology to create a foundation for safety research, policy decision-making and safety impact evaluation. We believe that this can best be accomplished by a single Surface Transportation Safety Administration. Until a single agency is created, NHTSA is ready and able to discover and respond to new and emerging transportation safety and related public health problems and trends. We have pledged that NHTSA will lead the nation in creating the highest level of road safety in the world. The following pages describe our plans for working with people, vehicles and the environment to create a safer future. New and traditional partnerships with States and communities, safety advocates and the private sector to enact and enforce effective traffic laws and build public support. Greater reliance on community-based safety programs reflecting increased power, social awareness of problems, and organizing strength of local entities. Development of new strategies addressing human factors that cause motor vehicle crash death and injury. Innovative research programs to analyze and understand the effects of human behavior on traffic safety. Partnerships with medical and allied public health care organizations to strengthen efforts to address vehicle and behavior safety problems. Vigorous program of public education and information to build heightened safety awareness and create strong new injury prevention ethic. Establish partnerships with vehicle manufacturers, equipment suppliers and allied research groups to facilitate and accelerate introduction of new safety advances in the marketplace. Promote U.S. regulatory framework worldwide as the most advanced and effective vehicle safety regulations extant. Modernize regulatory actions through new approaches such as negotiated rulemaking conducted through partnerships with industry. Foster an effective safety assurance effort to ensure that the public enjoys the intended safety benefits set forth in regulatory actions and that the vehicles they drive are free from safety-related defects. 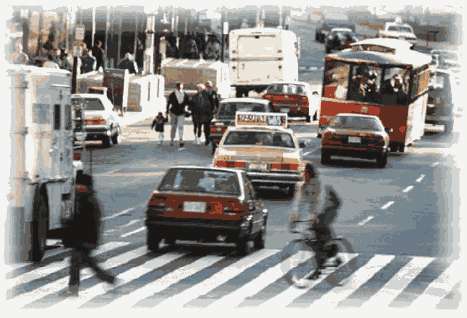 Provide world leadership in research, development and evaluation of advanced technology to enhance traffic safety. Provide for consumer education and safety information in order to meet public demands and create market forces for enhanced vehicle safety. Effective behavioral and vehicular safety programs promise to reduce societal costs of traffic crashes, including the economic burden borne by tax payers and the U.S. health care system. Safety initiatives integrating education, enforcement and engineering to create effective solutions that avoid or reduce the negative economic effects of crashes. Increased public awareness of the cost of crashes to reinforce responsibility for personal decisions as part of an injury prevention strategy. Information collection and analyses that calculate the true cost of crash injury and pinpoint the potential economic benefits of programs that achieve safety goals. Advanced post-crash notification, victim extrication and treatment modalities that control costs through fast, effective treatment by emergency response personnel and medical facilities. Advancements in rehabilitation medicine that improve treatment and shorten recovery periods, and in turn accelerate return of crash victims to normal functioning. Support for State, community and private sector safety data collection and analyses crucial to problem identification and effectiveness measurement. Specialized approaches to data systems such as the Crash Outcome Data Evaluation System (CODES), Crash Injury Research and Engineering Network (CIREN) and community systems (for Safe Communities problem identification) to meet specific safety needs. New injury databases that report true costs as well as long-term effects on quality of life. Linked data systems that permit multi-dimensional analyses, including linkage of crash injury and medical treatment data, vehicle engineering and injury causation data with crash investigation findings, and injury data, prevention strategies and health care costs. Interconnection of various data systems to permit safety information flow among various governmental and private organizations internationally. Advanced techniques to expand analytic capability, including simulation and modeling of human behavior and vehicular operations. An organization attuned to customer service and the public's need for safety information. Multi-disciplinary workforce possessing critical skills necessary for managing cutting edge technology focused on human behavior, engineering, medicine and allied public health areas, problem assessment and effectiveness measurement. Flexibility to discover and respond to new and emerging transportation safety and related public health problems and trends. Highly functional in information collection, analysis and dissemination in critical areas such as consumer information hotlines, and clearinghouses which provide the latest information on best safety practices. Research leadership worldwide in crucial safety concerns of vehicle biomechanics, human factors, advanced occupant protection and collision avoidance. Strong presence outside Washington capable of creating partnerships that address safety issues on a regional basis and maintaining a strong outreach to community-level safety program initiatives and advocacy groups. Sufficient resources to reflect the national priority given to achieving safe surface transportation.